TeamWA | Geoconferences (WA) Inc.
TeamWA is a subcommittee of Geoconferences’ Planning and Implementation Committee. 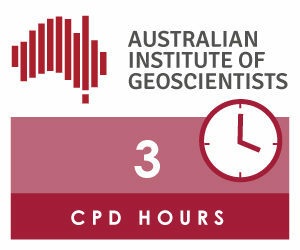 It was formed to organise a series of workshops to include at least three presenters who will speak on a common, process-related topic of relevance to the Western Australian geoscientific community, with an aim to drive innovative thinking. The workshops are to facilitate and encourage exploration through cooperation, communication, and by developing partnerships. The speakers for each workshop are drawn from academia, industry and government, in order to illustrate the theory, background, and practical use of current and emerging methods and techniques applicable to driving effective exploration in Western Australia. This will facilitate a direct feedback loop between all facets of the minerals sector. TeamWA Workshops aim to be half-day programs and held twice a year and where possible, they will include invited high-profile speakers from abroad who can present cutting-edge innovative research or technology. Each workshop will involve presentations by the speakers with ample time to facilitate focused discussions with the audience. Registrations now open. Please click here to register. Presentations are available for some of the past events organised by TeamWA Workshops. The Mineral Systems approach attempts to view the spatial and temporal distribution of ore deposits by relating the processes that control the source, transport, and deposition of metals and other commodities to the evolving structure of Earth’s crust and mantle. The change from searching for specific types of mineralisation to understanding aspects of hydrothermal or magmatic architecture at different scales presents new challenges and perspectives for acquiring, processing and interpreting geophysical data. For this TeamWA workshop we have invited a series of talks by expert geophysicists who address this topic by presenting advances in methods, and case studies. Four speakers will outline their views on how geochemistry can help in a regional scale exploration program. Talks will range from considering regional scale soil geochemistry (David Cohen, University of NSW), hydroceochemical mapping (David Gray, CSIRO), pXRF methods for regional scale targeting (Nigel Brand, Portable XRF Services) and the consideration of geochemical signatures of porphyry-copper (gold) systems (Steve Garwin, Steven Garwin Pty. Ltd). Read the article Geochemistry for regional-scale exploration: improved methods for improved targeting, written as a forerunner to the event. Seismic is a powerful yet underutilised range of techniques in mineral exploration. Long used in the oil and gas space, seismic is becoming increasingly important in the hunt for hidden mineral deposits, from imagery of regolith through definition of fluid pathways to direct imagery of metalliferous deposits.